Hi everyone! 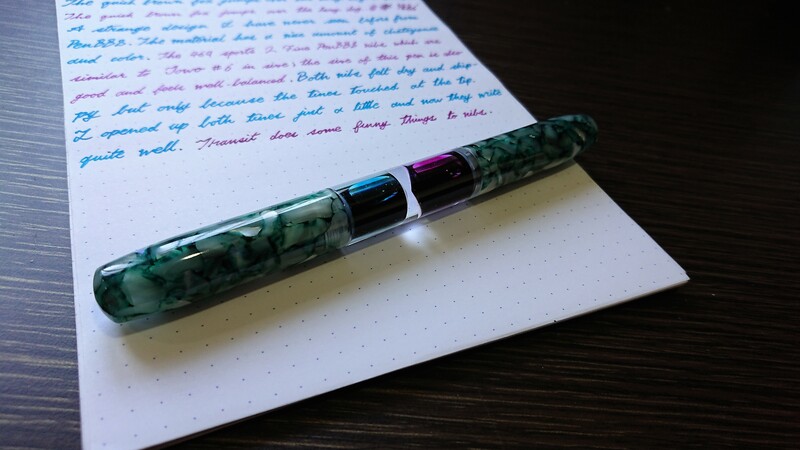 I'm Chiffon, and today, on my first blog post; we have a new PenBBS pen and design. 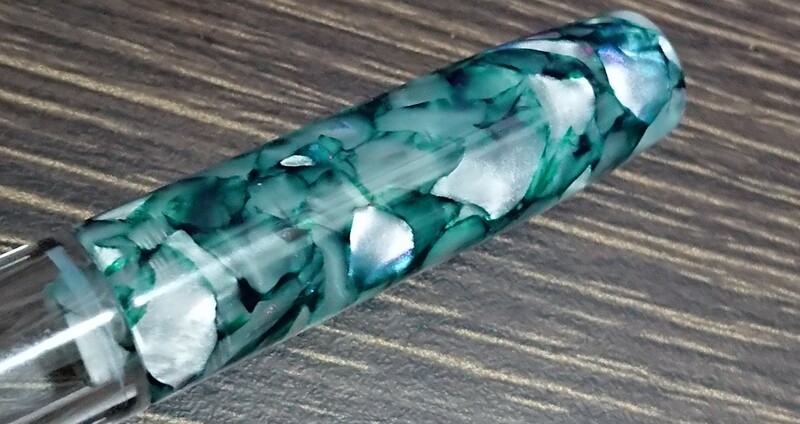 Briefly, this is a double-ended fountain pen with 2 Fine PenBBS nibs and both chambers are eyedropper. The packaging is a little leatherette box with a magnetic snap cap that has an embossed PenBBS logo on the top. Very snazzy. 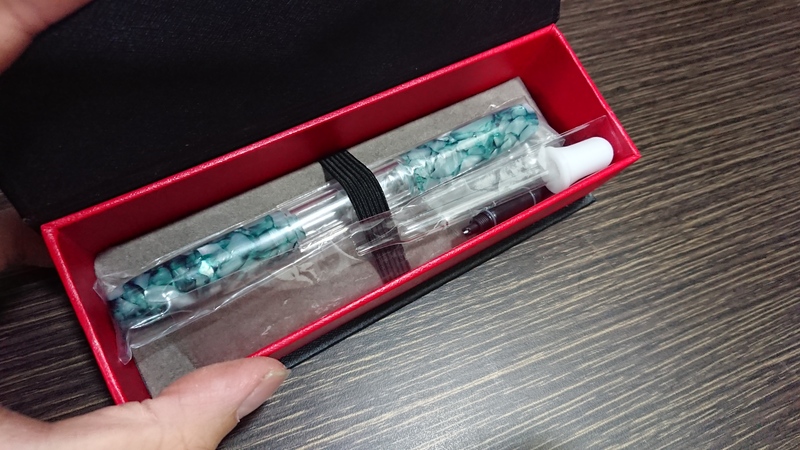 Inside, the pen and its accessories are packed within plastic sleeves, held onto the bottom of the soft material by an elastic strap. 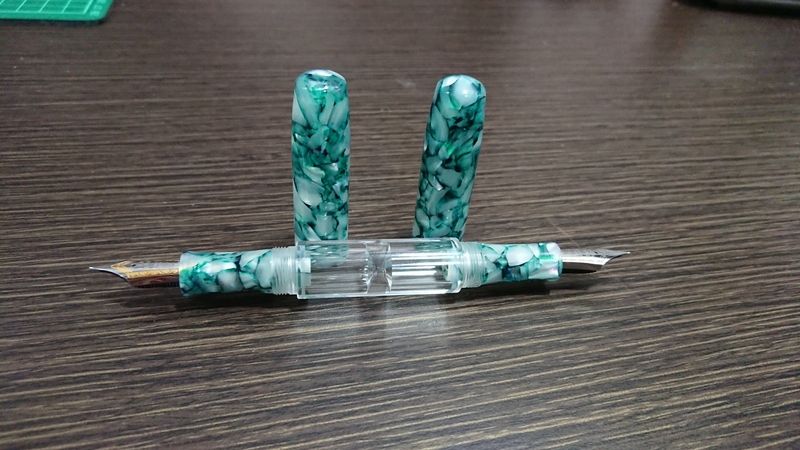 The accessories provided are an eyedropper to fill the pen and single rollerball nib and feed (similar to the one provided with the PenBBS #350 pen). The pen has screw caps on both ends which uncap with 2 full rotations. Both screw caps can be used interchangeably. Do note that its likely both nibs will not be aligned with each other. I actually took out one of the nibs to align it with the other. Each chamber stores close to 1 mL of ink. If you look closely, the caps differ slightly where its round on one, and slightly pointy on the other. This could be useful for figuring out which end of the pen to use by just touching the cap while the pen is in your pen case. The material is a chatoyant acrylic called Moon River. 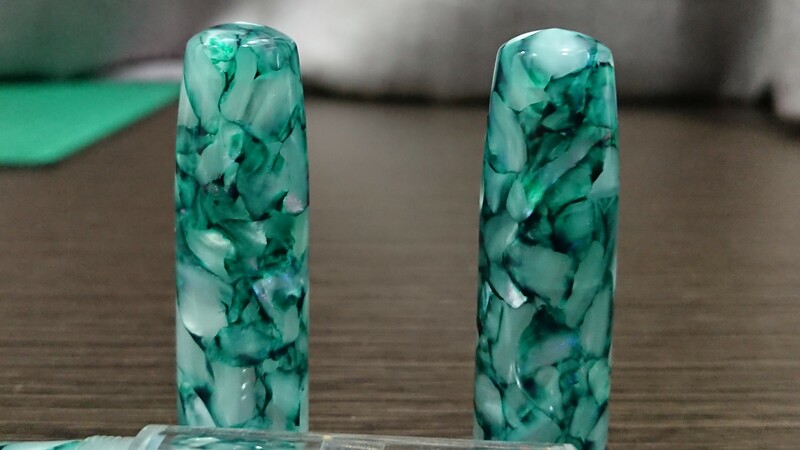 It has a very well done cracked ice pattern with pearlescent white spots and dark green "veins". A closer look reveals the pen is sprinkled with specks of purple, pink and blue powder. 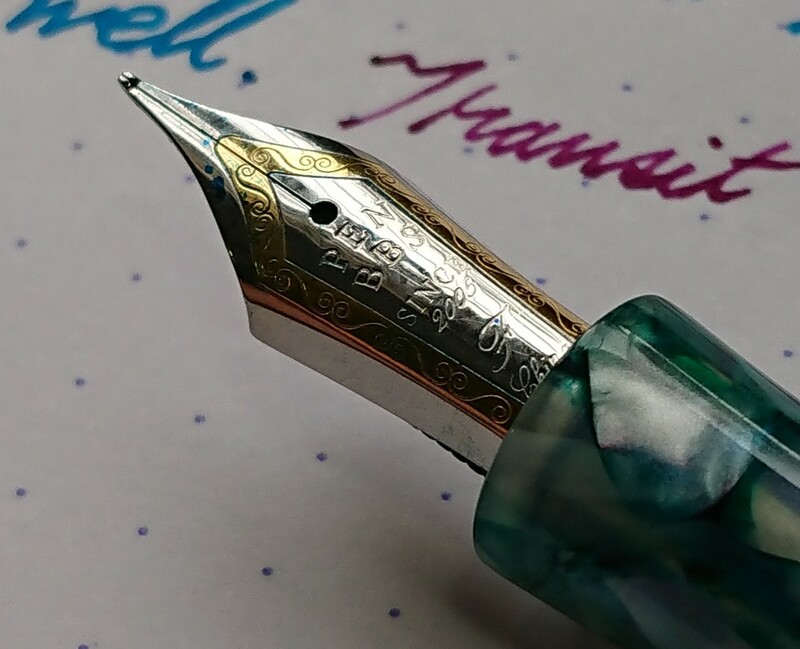 Lastly, the material's pattern is very polished and consistent on both caps and both nib sections. A close up of both PenBBS nibs (similar to Jowo #6) which are stainless steel fine nibs (Western size). One is duo tone while the other is a monotone but both have the same lovely scrollwork from PenBBS. 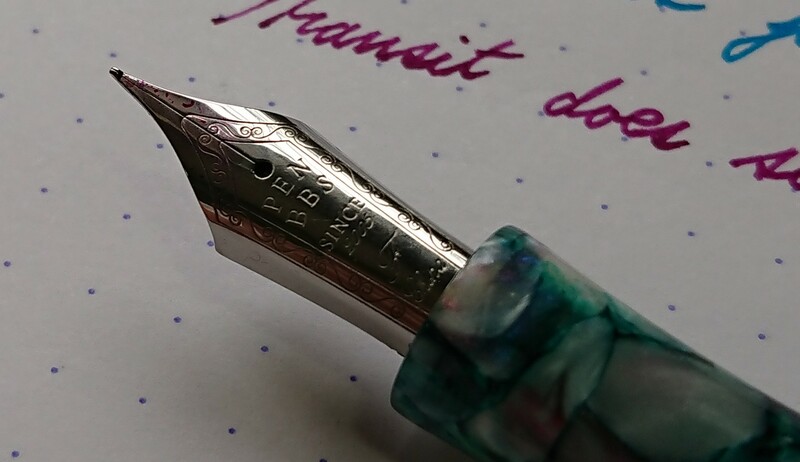 Both nibs have the slight upturn at the tipping characteristic of PenBBS nibs. Both nibs are friction fit into a housing which can be screwed out to swap with the rollerball nib and feed. The pen feels comfortable and well-balanced in my hand. 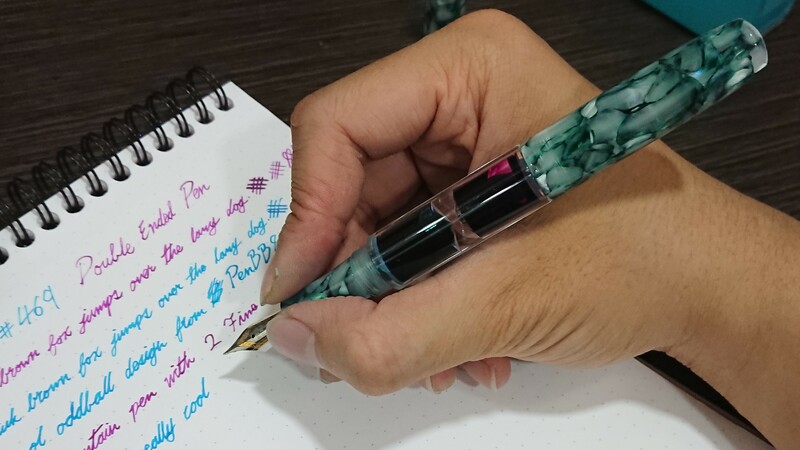 It didn't feel slippery nor tiring to hold even after 20+ minutes of writing with it. The tines touched at the tipping so I widened them very slightly and now they write quite well on this Rhodia pad. 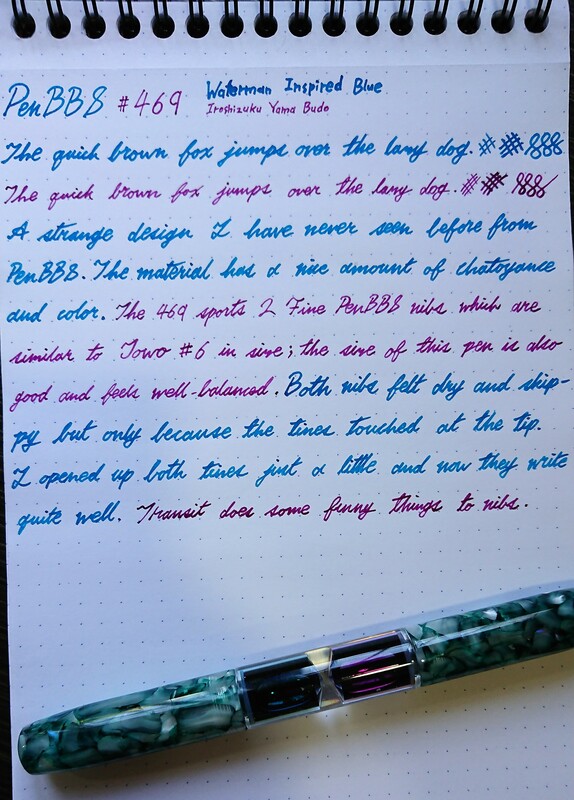 Both nibs have moderate flow and did not skip nor felt scratchy with a wet ink. I believe a touch of micromesh would improve your writing experience with it. 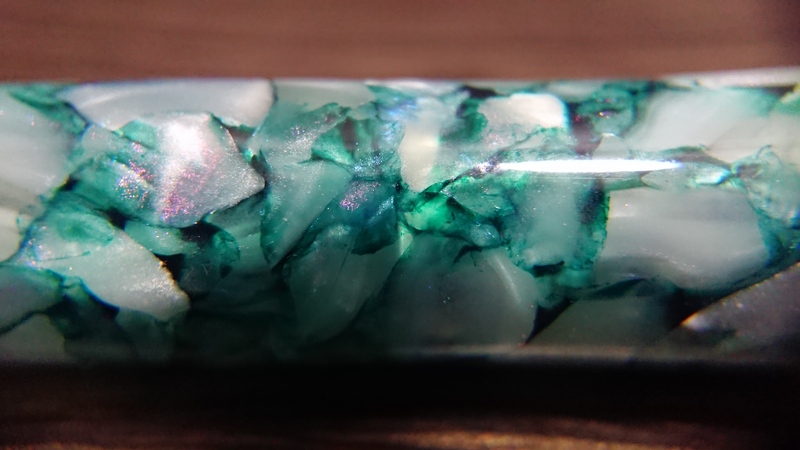 I also stored it vertically for a night and there was a small drop of ink in the cap of the Yama Budo end...but it should be fine since the cap is large and there's no inner cap to clean. 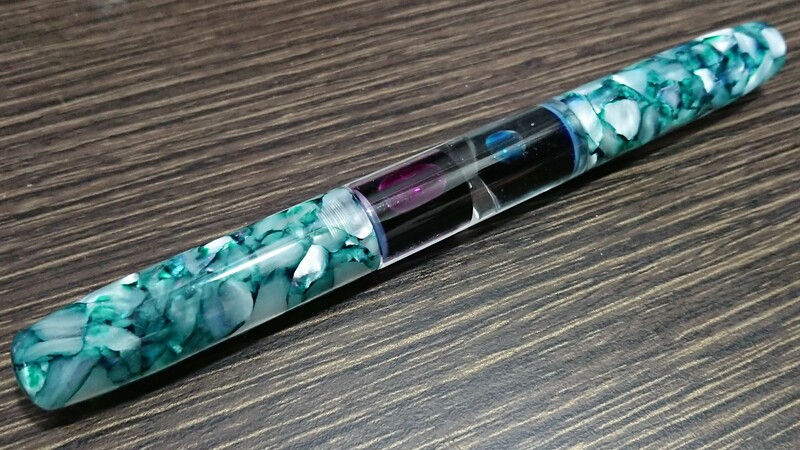 Overall, I'm very pleased with this novel design and material from PenBBS. It's a decent writer with 2 nibs in one. I only wished PenBBS gave a different nib type or size on one end but Chinese fountain pen users generally prefer Fine nibs. If you've always wanted to try what a double ended fountain pen feels like, this is a good buy to test the waters.